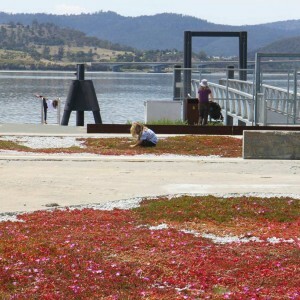 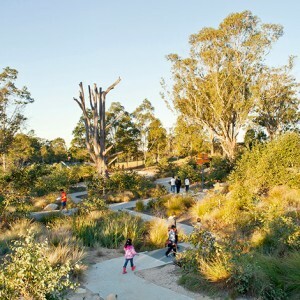 McGregor Coxall: The original Pimelea parklands was constructed prior to the 2000 Sydney Olympics. 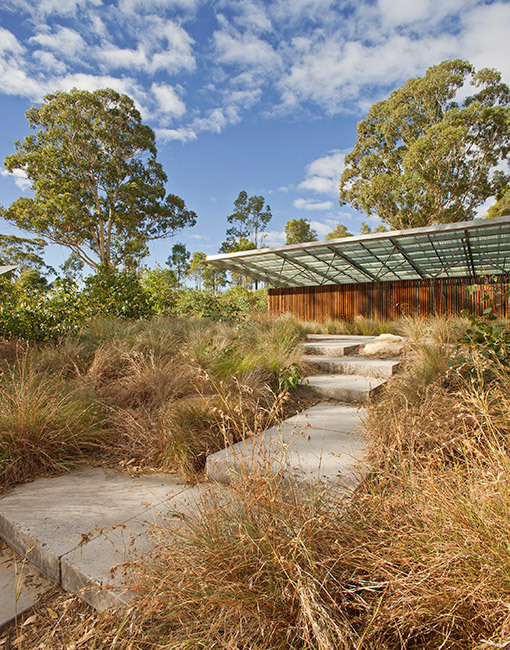 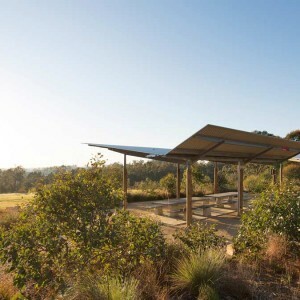 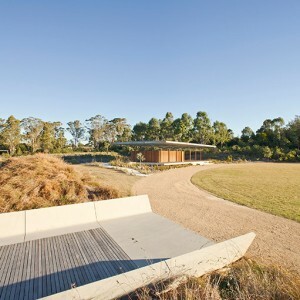 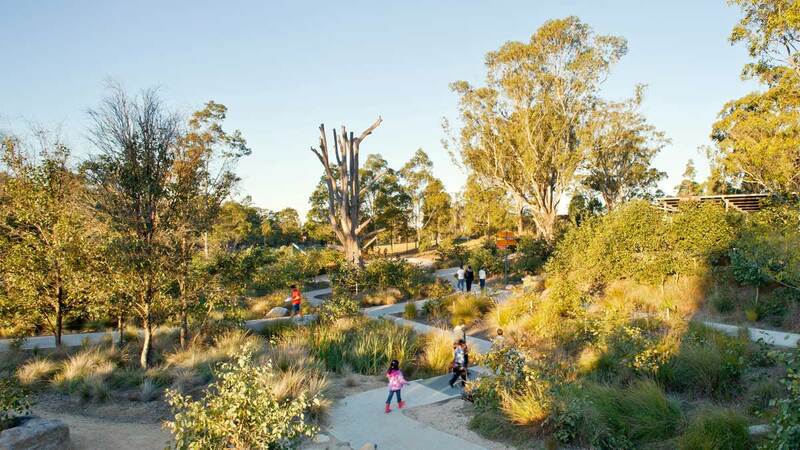 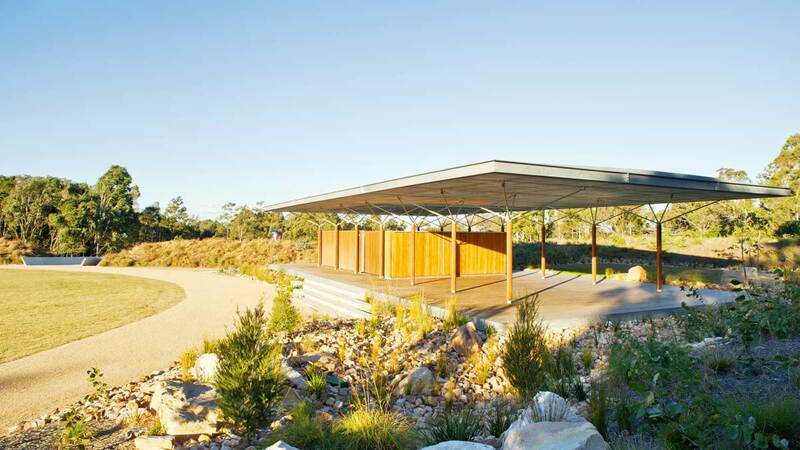 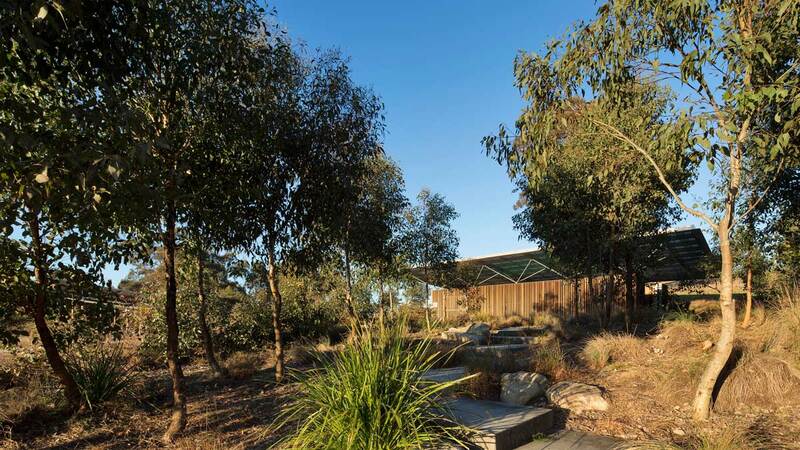 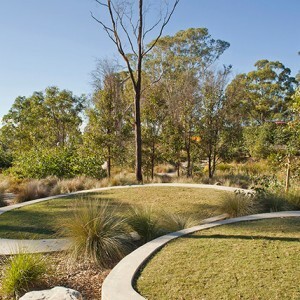 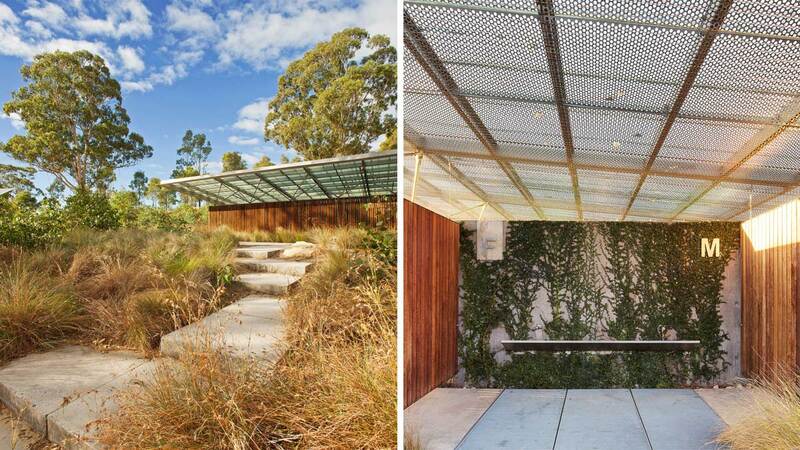 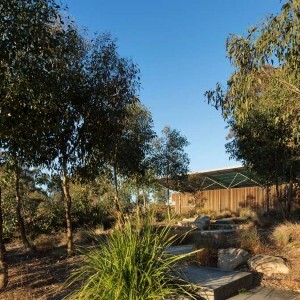 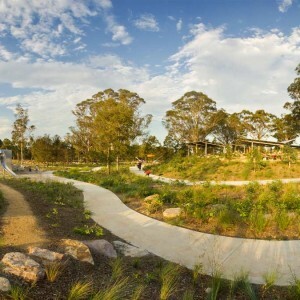 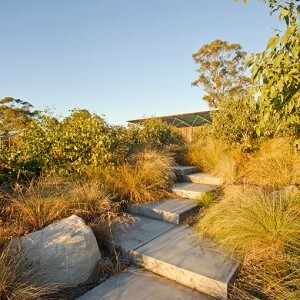 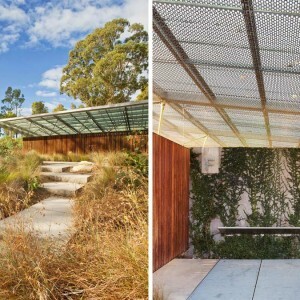 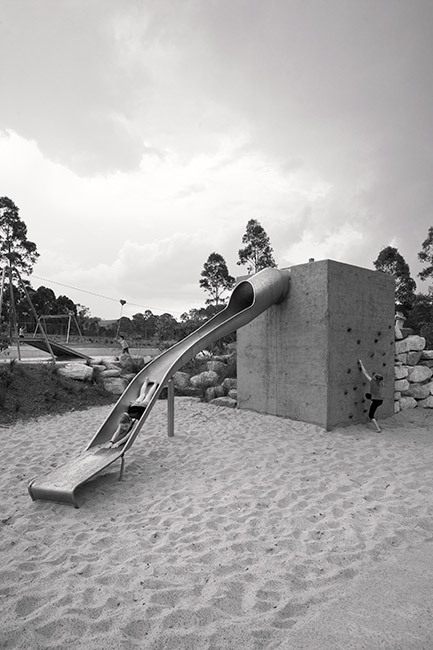 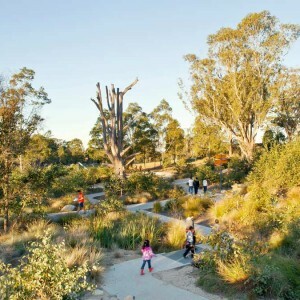 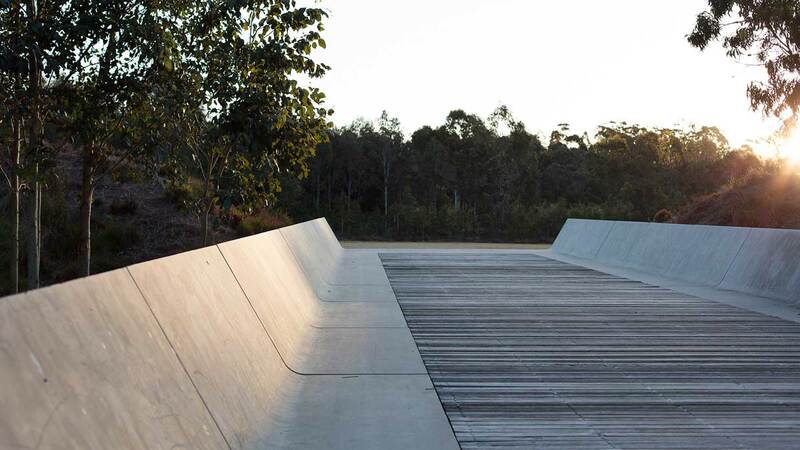 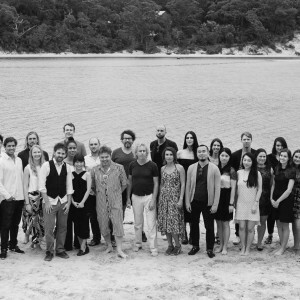 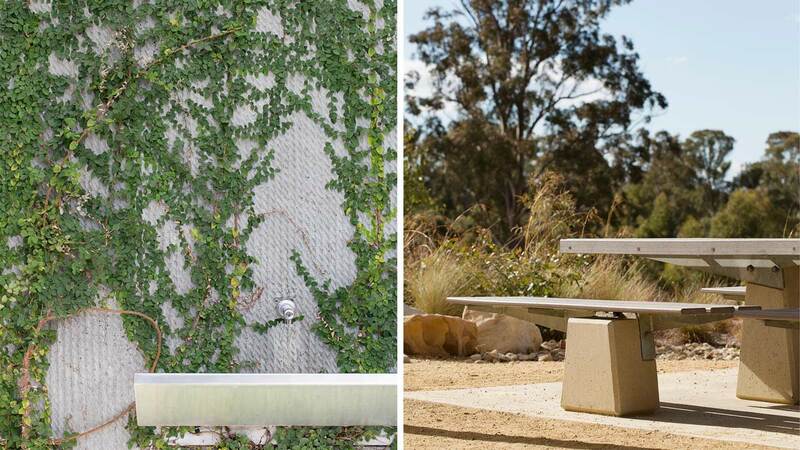 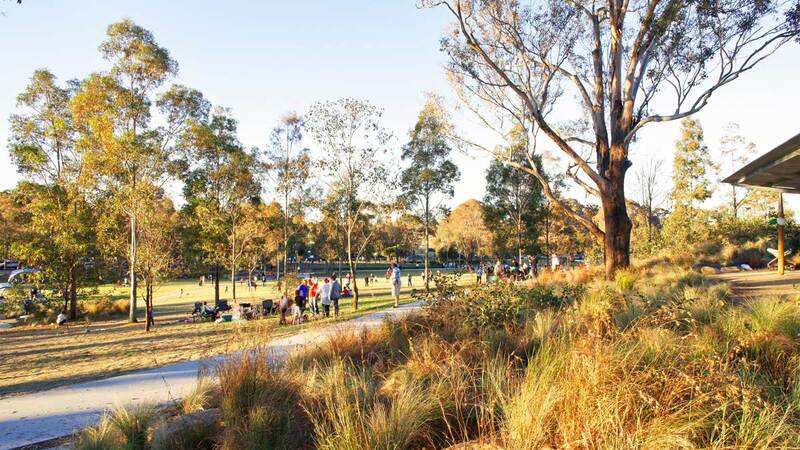 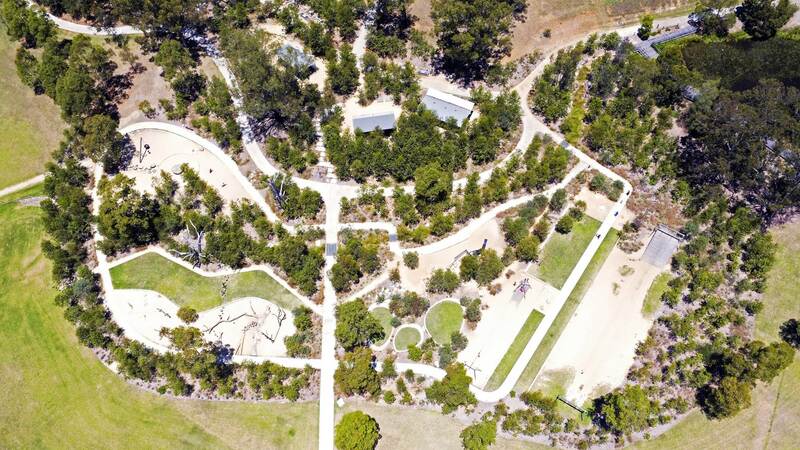 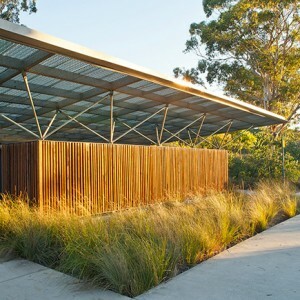 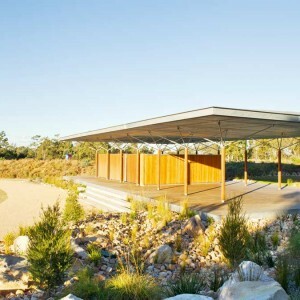 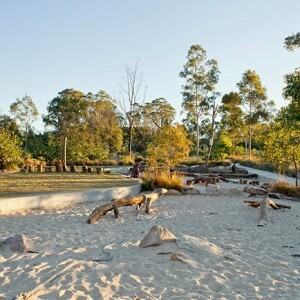 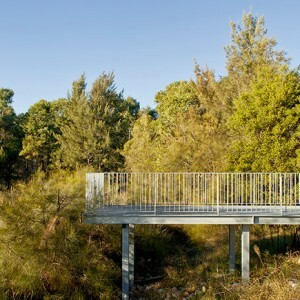 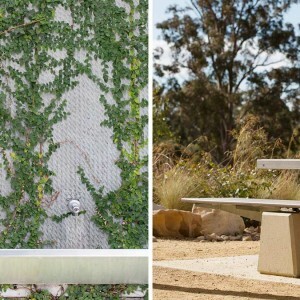 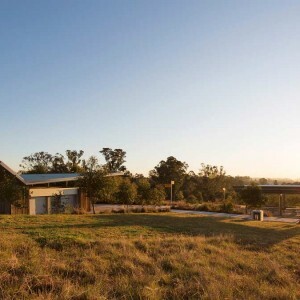 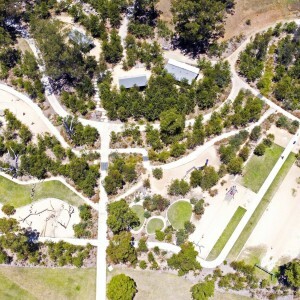 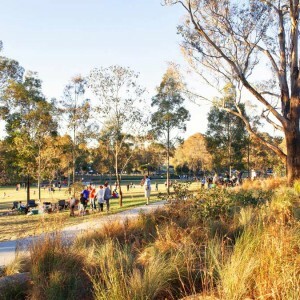 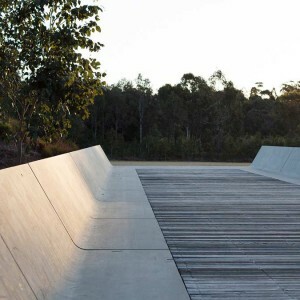 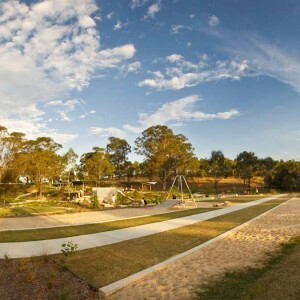 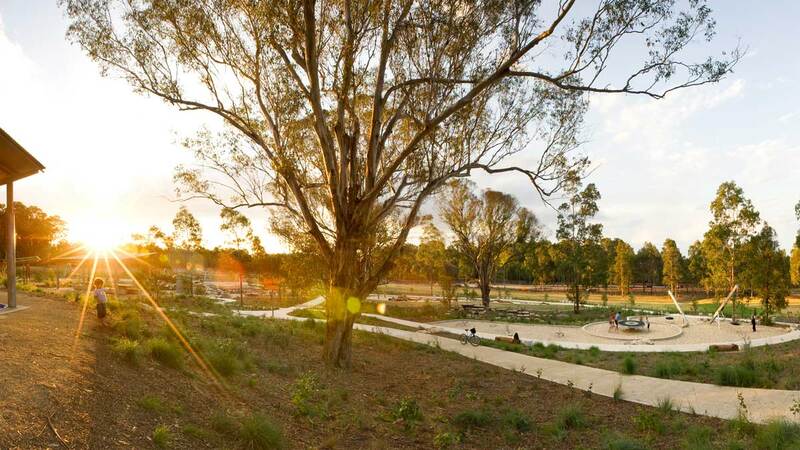 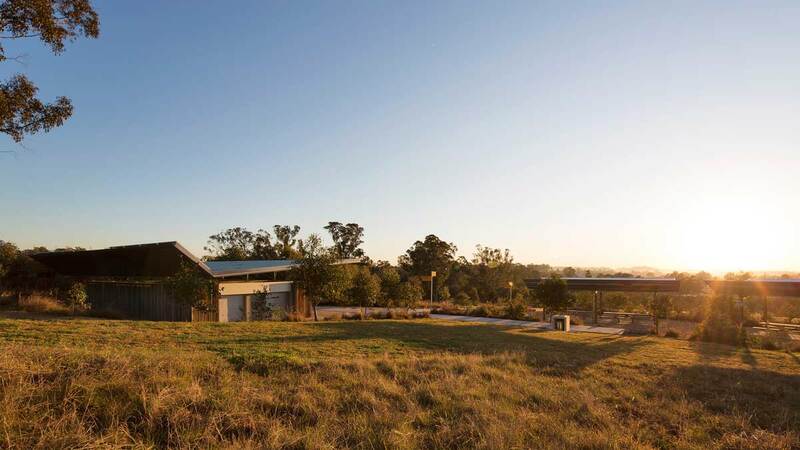 The Western Sydney Parklands Trust engaged McGregor Coxall to revitalise and extend the parks facilities by first undertaking a master plan and then designing and documenting the master plan. 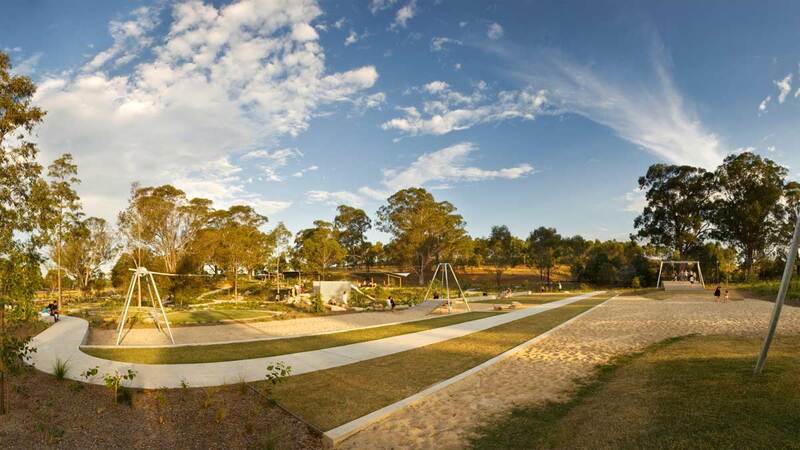 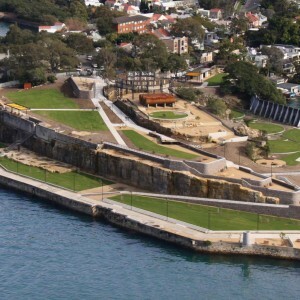 This included an upgrade and extension to the existing toilet blocks, BBQ and picnic facilities, redevelopment of the children’s play area, the development of an events space and access bridge along with the construction of a significant new car park. 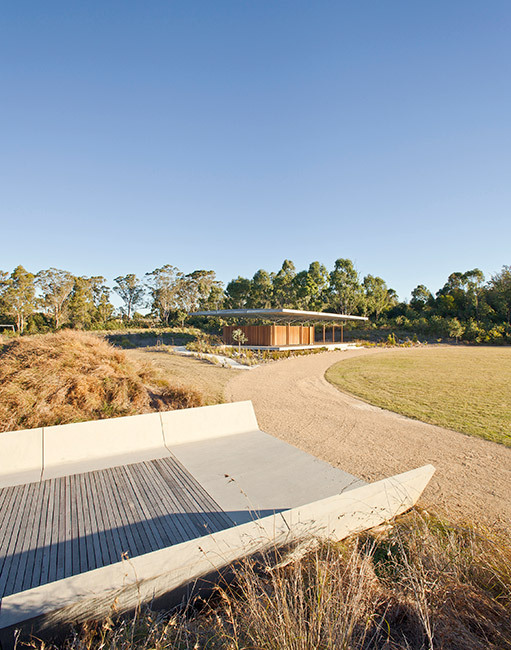 A sensitive response to the rural nature of the site, underpinned by a strong sustainable strategy, drove the site’s redesign. 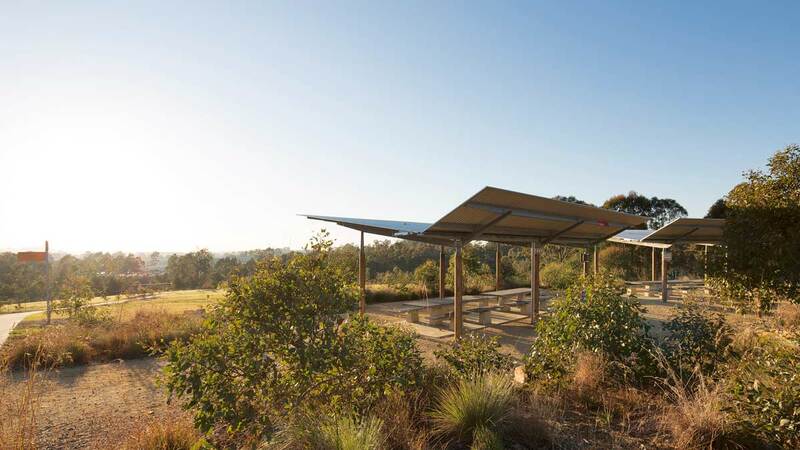 Power for the site is generated by solar panels, toilet flushing utilises dam water, all grey water is reused for irrigation and recycled materials are used where possible. 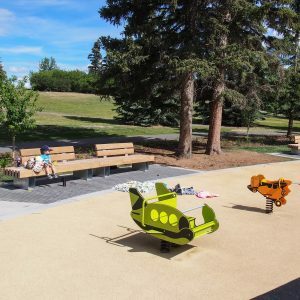 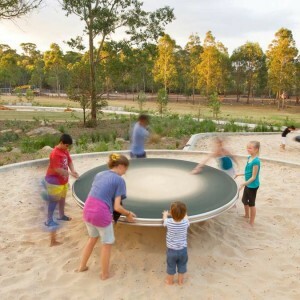 The play area extends this concept by introducing recycled water through a children’s play pump and water course system within a unique play experience that both excites and delights. 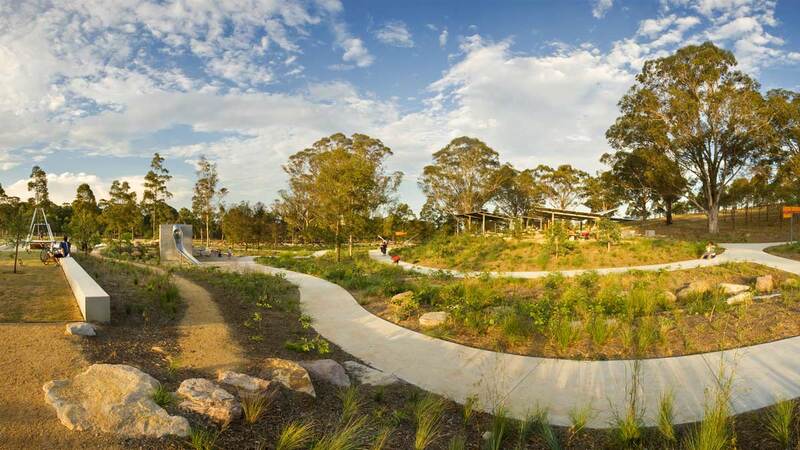 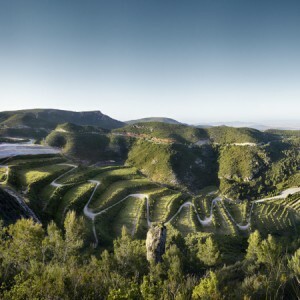 The design for the park focuses on developing a structural layout that works closely with the existing rolling contours of the site so that all elements, despite their scale, nestle or fold into the landscape. 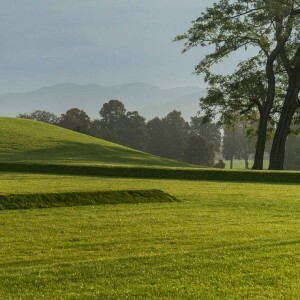 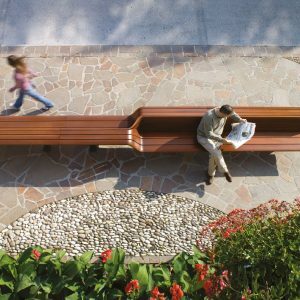 This fine grain attention to siting and levels along with the use of a simple palate of materials has produce a park that, despite its size and number of facilities, sits comfortably within the landscape. 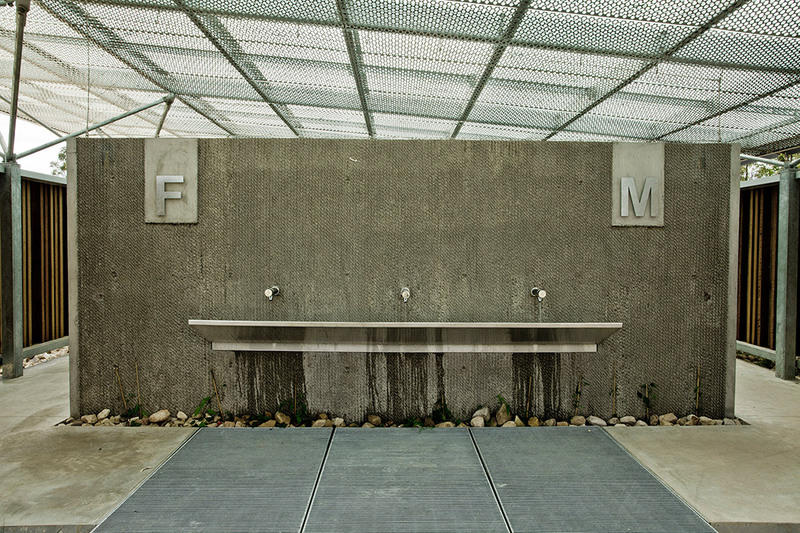 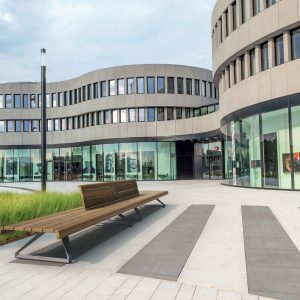 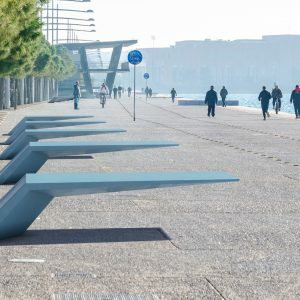 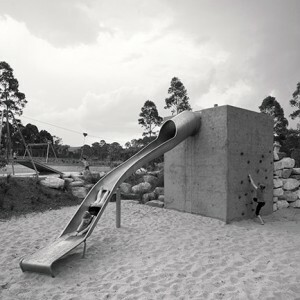 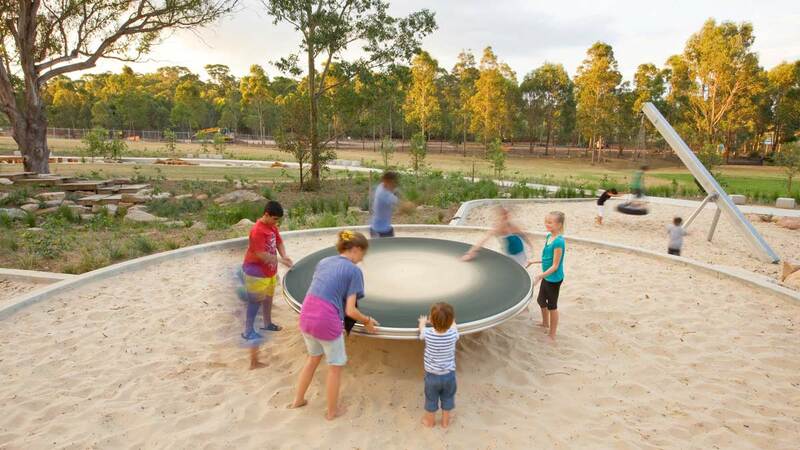 All elements from toilets, barbecues and playgrounds were sited to ensure both visual and physical connectivity whilst still allowing each to have their own sense of place. 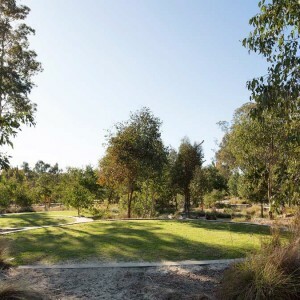 These outcomes were further developed working closely with the existing site contours and then overlaying a planting structure of endemic grasses and trees. 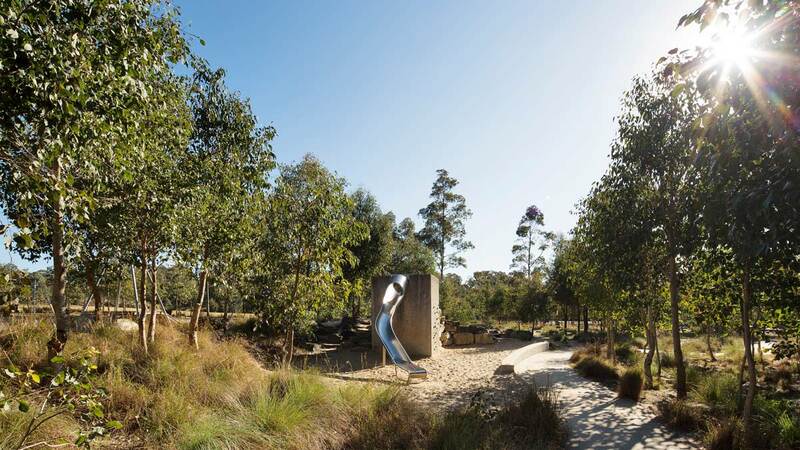 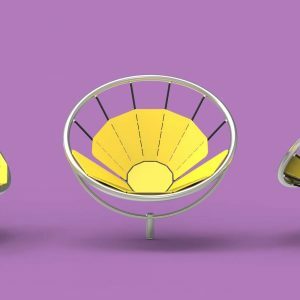 The extensive new playground designed in association with Fione Robbe and Equatica aims to develop a design within a contemporary Australian aesthetic. 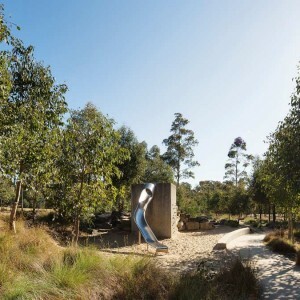 Centred around an ephemeral water course starting at the site dam, the playground aims to engage children’s understanding of the scarcity of water in the traditional Australian landscape by having points along the water course that has hand water pumps for the children to pump and play with. 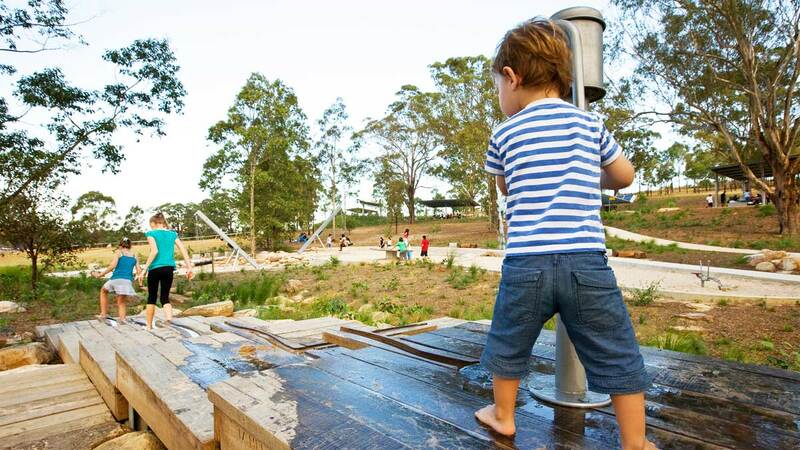 The concept here is that water is not an abundant resource and the pumps in themselves become a play object. 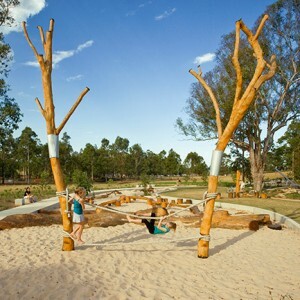 The playground is also carefully sited within an existing stand of trees in order to utilise their shading quality. 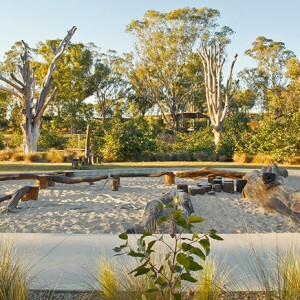 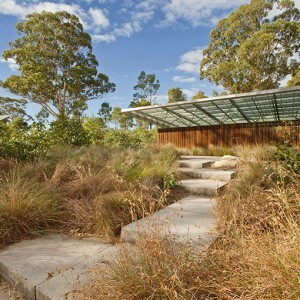 Sand, rather than play matting, is the safety surface, a more natural and giving material in this landscape. 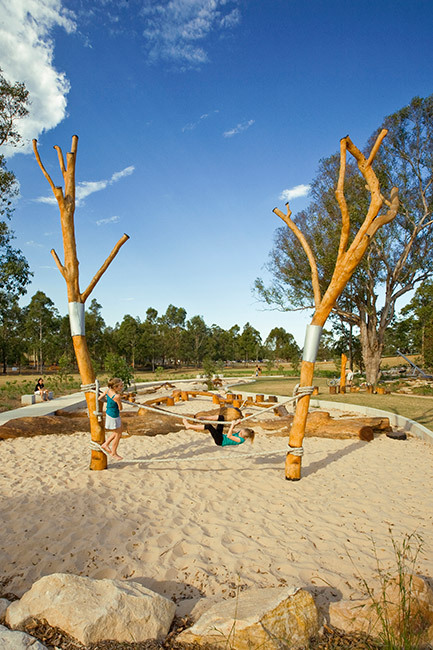 Dead trees from the site have been felled and crafted into sinuous interpretive elements that encourage interpretive play and a tactile experience for all children, but particularly, those groups that are now coming here for this type of play experience. 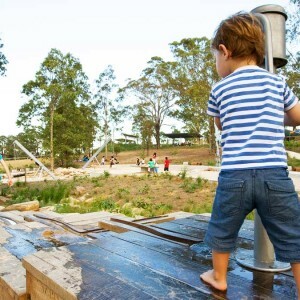 These children are physically and mentally challenged and the response from their carers has highlighted the need for more of these types of play experiences across Sydney. 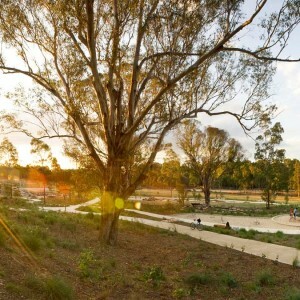 All carparks within the site are designed with a “no pipe” strategy. 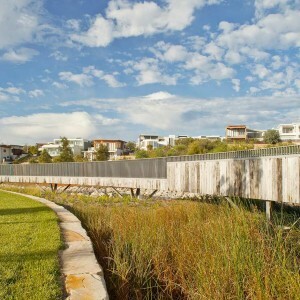 This design strategy uses above ground water flow to manage storm water movement rather than the traditional pit and pipe system. 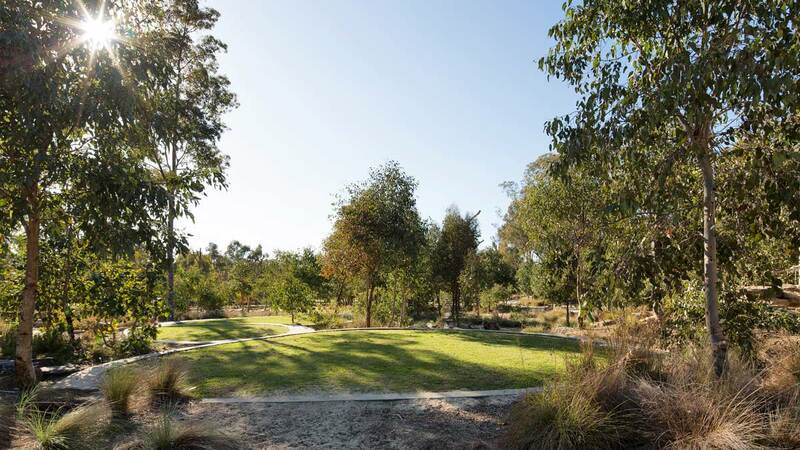 The carpark has been designed to sheet storm water into an open planted wetland swale system that captures and cleans the water before discharging into the site dam for reuse. 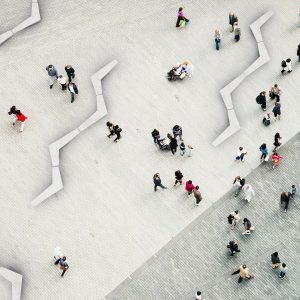 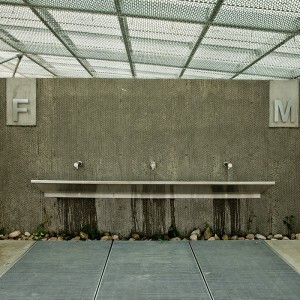 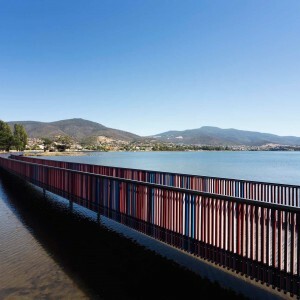 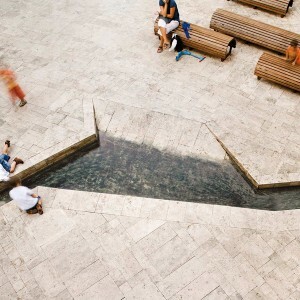 This design strategy celebrates the ephemeral rain events and allows visitors to understand the water flows and organisation embedded in the park’s design. 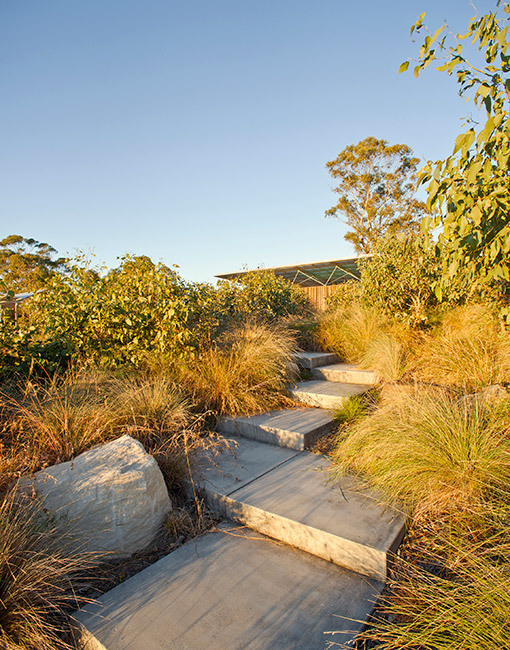 At the finer grain design level, wheel stops in the carpark become water spouts releasing water from one level of the carpark into the lower level and its wetland system. 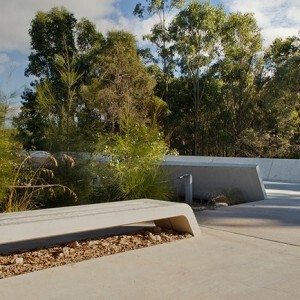 This overall design approach is not only aesthetically pleasing but also cost effective.